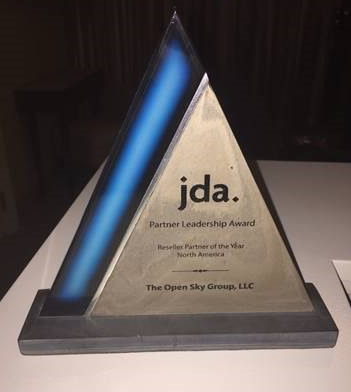 Open Sky Group (Open Sky), specializing in JDA (RedPrairie) Warehouse (WMS), Labor (WLM), and Transportation (TMS) software is proud to be recognized as the Top Reseller NA by JDA Software for the second year running. Open Sky was founded over ten years ago, by a group of RedPrairie (now JDA) experts who adapted the systems for companies enabling them to fully realize the benefits of their investment. Open Sky Group (Open Sky) specializes in services for WMS, Labor and TMS software implementations. Open Sky is also an Authorized Reseller of JDA Warehouse (WMS), Warehouse Labor (WLM) and Transportation Management (TMS) software. Named twice to the Inc. 5000, an exclusive ranking of the nation’s fastest growing private companies, Open Sky strives every day to be the best consulting partner on the planet for implementing Supply Chain solutions. Open Sky has also achieved Top Reseller NA from JDA Software two years running. Previous Post: WMS Proof Of Concept - Why is this so Critical to a WMS Project?